This park has a lot to offer. Adjacent to a parking area, steps lead to the pool that gives the park its name (not to be confused with the other Blue Hole on Lighthouse Reef. The stairway leads down through the forest, and birds can often already be seen resting on over-hanging vines, especially emeraldgreen Jacamars and Blue-crowned Motmots. Also took out for the Scarlet-rumped Tanager and listen for the Nightingale Wren. Another common bird around the Blue Hole is the Long-tailed Hermit, a mainly brown hummingbird with white tail, which often dips into the water for a quick drink. Back in geological time, the pool itself was a stretch of underground river cave, but it lost its cover when the roof collapsed. Since the Hummingbird Highway was built, it has been a favourite swimming spot, with refreshing cold water. If you have a snorkel, bring it so you can peer down into the eerie blue cavern where the water comes from. The strearn carries on about 40 yards before descending down a siphon through an echoing cave full of bats (and a few Cliff Swallows in the winter months), and later on re- emerges to join the Caves Branch River. If you're coming from Belmopan, you will already have driven over it. The surrounding limestone is full of caves, and it was only by tracing coloured dyes that it was ever discovered that this was the hydrological connection. The park has a small trail network, particularly good for birding because the forest canopy is low. This Hummingbird Loop can be walked in an hour or longer for those wanting to linger and see more. As well as the trees. the rich forest contains a wealth of bromeliads, mosses and ferns. more visible than normal because of the steep lay of the land. The other park features which offers a respite from the heat is St. Herman's Cave. It's another part of lattice of sink holes, caverns and creeks that riddle the area. Its relatively small opening is draped in lianas, but steps are provided to descend into the dark interior. If you bring a torch and go with a guide, the cavern can be followed for almost a mile. The trail then emerges and loops back through the forest to the starting point. You can admire the delicate cave formations, but as the stalactites and stalagmites take about 800 years to grow an inch, definitely don't touch them. The park is very easy to reach, set right next to the Hummingbird Highway. There are two access points, the visitor centre/parking area for Herman's Cave, and the lay-by just above the Blue Hole. The two are only a mile and a half apart. The National Park is just 12 miles southeast of Belmopan (on the right coming from that direction), and can easily be reached by bus. Tours also run from San Ignacio and Belize City. Exploring the park takes about half a day. Anytime though Blue Hole gets decidedly muddy after a heavy rain. The park has a new visitor centre. If you are coming from Belmopan, it is on the right hand side of the road. next to a large grass parking area. St. Herman's Cave is just 10 minutes walk from here, along a forest trail. Blue Hole is a mile further, also on the right hand side. It has a guard station, with staff on hand to offer further guidance if needed. The Fireline Trail connects the Hummingbird Loop to the trail leading to St. Hermans. and is just under a mile. The St. Hermans and Jungle Walk Trails that go through the cave. The National Park is open daily from 8 am to 4 pm and is managed by the Belize Audubon Society, who have a small pamphlet about it. Belizeans pay an entrance fee of $2 and foreigners $8. The site has rest areas, benches, parking facilities, a visitor centre and 1 guard house. Whilst it has had trails since the late 1980s, the first phase of a new trail system has been constructed, This consists of a loop trail, a cross-park trail, and St Hermans cave trail. From approximately 520 visitors a year recorded during its early history, visitor numbers reached 4634 in 1991 (64% non-Belizean) and 7459 in 1993 (69% non-Belizean). All these are under-estimates because of under-recording of visitors. After heavy rain, the Blue Hole can turn decidedly muddy and rather unpleasant for swimming. Mayan artifacts have been found within the site, at St Hermans Cave, 1.25 miles southwest of Blue Hole. As far back as 1965, the site's cave was recognized as suitable for tourism. Part of the site was proposed as a National Park by Waight (1968) and the whole site was proposed as a National Reserve by a FAO (1978). The GOB having acquired part of the site in the early 1960s and the remainder in the 1970s, declared it as a National Park in December 1986 (SI 109). The area of the reserve is straightforward to calculate, being derived from a property survey (Entry 1272). The SI gives an estimate of 575 acres, taken from the survey. The area calculated by GIS is 665 acres. The site was declared to conserve the recreational value of its interesting and easily accessible geomorphological feature, as it is a popular spot for picnickmg and swimming, and there are caves in the park.The surrounding forests also seem to be rich in wildlife. The park's wildlife has not been systematically studied. Vegetation is secondary low forest rich in lime loving species, with some regeneration of mahogany. During a one day field visit, 63 species of bird were recorded whilst walking the site's trails. The reserve has no permanent resident population. Belmopan (capital) is roughly 7 miles northwest, while the closest significant settlement is the farming village of Armenia (population roughly 400), 4 miles to the north- and the estate camp of Caves Branch (population approximately 70) is 2 miles west. To the east of the park, and adjacent to it, is the small (7 family) farming settlement of Ringtail Homestead. The site covers a well developed karst landscape, centered around Blue Hole. This surface collapse feature, known as a cenote, was created by the collapse of an underground limestone cave. In this case, the river running through the original cavern still flows through the cave system, and forma a clear deep poll at the bottom of the cenote. 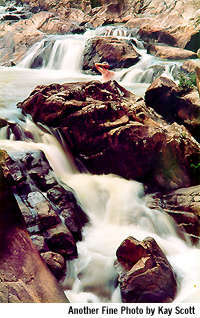 The river itself is a tributary of Caves Branch, which later flows into the Sibun River. It rises 60 W to emerge at Blue Hole, and flows 100 feet before returning underground- There am two other sink holes and St. Hermans cave (Mountain Cow and Petroglyph fall outside the site). St Hermans is the base of a large sink hole with a main passage which exceeds 50 50 feet in height in places, and 100 feet in width. The cave's stream is perennial, though its water levels vary considerably according to season and rainfall. The distance from mouth to mouth of the cave is, depending on the route taken, about 2500 feet. The Blue Hole is at the northeast comer of the park, while St Herman's is in the southwest. The 2 are apparently connected by an underground strearn. The site's elevation ranges from about 200 feet above sea level by the Hummingbird Highway, to over 650 fed in the hilly interior. It receives on average approximately 85 inches of rain a year, and experiences a dry season that typically Lists from January to April.